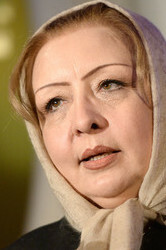 Mrs. Najiba Ayubi was born in 1968 and hails from Parwan province. She went to Hira Hifgh School in Parvan Province. She has a Bachelor degree in Dari literature from the Parwan Institute of Pedagogyis a journalist and activist for human rights and freedom of the press. She is the Director of the Killid Group, a non-profit Afghan media network encompassing press, radio, and online outlets with a national reach. Ayubi left Afghanistan with her family when the Taliban seized Kabul in 1996. She took refuge in Iran where she established a school for Afghan refugee children. When the Taliban fell in 2001, Ayubi turned down an opportunity to migrate to Europe, and rather returned to Afghanistan, where she worked first for Save the Children, and then joined the Killid Group as managing director. She is also a board member of the NGO Development and Humanitarian Services for Afghanistan. Ayubi was awarded the Courage in Journalism Award for 2013 by the International Women's Media Foundation. (20140603) She leads a team of reporters working in print, broadcast and online media that includes two of the country’s most popular magazines (Killid Weekly and Mursal Weekly) and eight radio stations with a total of 12 million listeners. She has refused calls for censorship and is passionate about independent media. Ayubi is the co-founder of the Afghan Independent Media Consortium and the Freedom of Expression Initiative, which aim to provide resources and support for independent journalists in her country.